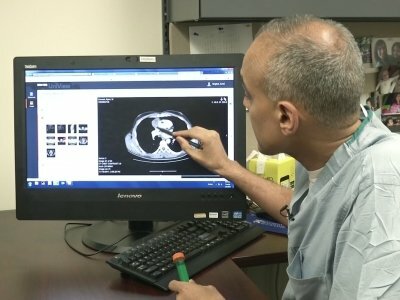 PHILADELPHIA (AP) — It was an ordinary surgery to remove a tumor — until doctors turned off the lights and the patient’s chest started to glow. A spot over his heart shined purplish pink. Another shimmered in a lung. Dyes may hold the most promise for breast cancer, said the American Cancer Society’s Dr. Len Lichtenfeld. Up to one third of women who have a lump removed need a second operation because margins weren’t clear — an edge of the removed tissue later was found to harbor cancer. But it also gave false alarms in more than a quarter of cases — “there were some areas where normal tissue lit up a little bit,” Smith said. Blaze Bioscience is testing Tumor Paint, patented by company co-founder Dr. Jim Olson of Fred Hutchinson Cancer Research Center and Seattle Children’s Hospital. It’s a combo product — a molecule that binds to cancer and a dye to make it glow. Avelas Biosciences of San Diego has a similar approach — a dye attached to a molecule to carry it into tumor cells. The company is finishing early studies in breast cancer and plans more for colon, head and neck, ovarian and other types.